"I think it's a work of genius," asserts Simon Price about Manic Street Preachers' new album, Journal For Plague Lovers. Price is a man who knows a thing to two about both the state of modern music and the band. He is the author of Everything, the best-selling biography of the Manics, and a respected music critic with the Independent on Sunday in which he reviews the band's ninth album this weekend. Journal For Plague Lovers is notable for the fact that James Dean Bradfield, Nicky Wire and Sean Moore have composed all 13 tracks around a folder of lyrics bequeathed to them by Richey Edwards, their former member who is missing and presumed dead, shortly before his disappearance in 1995. It has taken the Manics this long to get around to using the lyrics for a variety of reasons, some obvious, and some not. "They had originally planned to publish the folder in a book," says Price. "But Nicky Wire revealed at least one of the lyrics in an interview - 'I want to cut the feet off a ballerina' - and Bloc Party used that in one of their songs. "I think perhaps that influenced the Manics in thinking that if anyone is going to put the lyrics in the public domain musically, they wanted it to be them." Price believes it's no coincidence that JFPL arrives after the commercial renaissance that their last album Send Away The Tigers provided, with ensuing accolades including NME's Godlike Genius Award. "I think they have been quite clever and crafty over the years in releasing big commercial records and then following it with something a bit more challenging," he says. "Send Away The Tigers was radio friendly rock and I guess it went back to the spirit of their album Everything Must Go. "But this album goes back to The Holy Bible, which is abrasive and harsh to listen to, harrowing and gothic. This is The Holy Bible part 2, from the lyrics and the same backwards font on the lettering to the same artist for the cover art. "The cover image is proving quite controversial in that Tesco won't stock the album, because it's a beautiful, bruised and bloodied child. The artist, Jenny Saville, says it's simply a child with a port wine birthmark, but I don't think anyone believes that. "I think it is meant to symbolise Richey's personality." Price, who has interviewed everyone from Kurt Cobain to Kylie Minogue, describes Richey as "a magnetic personality and an impressive person to be around". Richey was legally declared dead last November, which obviously took its toll on his family and the band. Over the years the trio retained the belief that Richey was still alive and well somewhere but Journal For Plague Lovers hints at some kind of acceptance of his death, closing with the track William's Last Words, a heartbreaking goodbye sung by Nicky Wire..
"I wouldn't want to put words into their mouths but I think people will read it that way," says Price. "Legally Richey has been declared dead but emotionally I don't think it's as easy as that for them to accept. 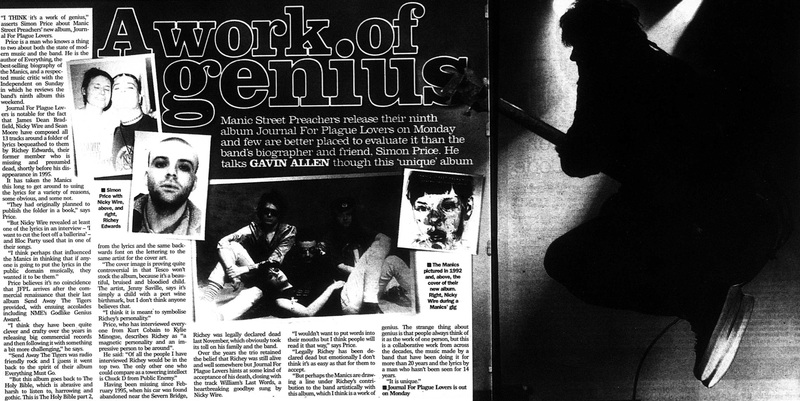 "But perhaps the Manics are drawing a line under Richey's contribution to the band artistically with this album, which I think is a work of genius. The strange thing about genius is that people always think of it as the work of one person, but this is a collaborative work from across the decades, the music made by a band that have been doing it for more than 20 years and the lyrics by a man who hasn't been seen for 14 years. This page was last modified on 3 September 2018, at 17:10.